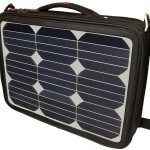 The Volatic Generator Solar Bag is the first solar bag powerful enough to charge a laptop. This Blue Pacific Solar solar laptop charger has high-efficiency cells and includes a battery pack custom designed to efficiently store and convert the electricity generated. It will also charge cell phones and most other hand held electronics. * Solar panel generates up to 15 watts using 20% efficient cells, enough to fully charge the Voltaic battery in about 5 hours. * Common adapters are included for connection to laptops, phones and other handheld devices. Optional reconfigured MagSafe adapter available for MacBooks.